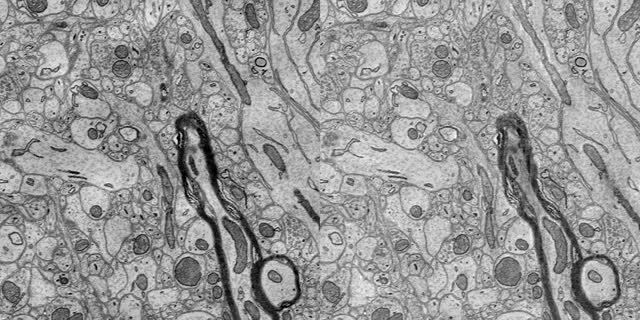 Investigations of biological ultrastructure, such as comprehensive mapping of connections within a nervous system, increasingly rely on large, high-resolution electron microscopy (EM) image volumes. However, discontinuities between the registered section images from which these volumes are assembled, due to variations in imaging conditions and section thickness, among other artifacts, impede truly 3-D analysis of these volumes. We propose an optimization procedure, called EMISAC (EM Image Stack Artifact Correction), to correct these discontinuities. EMISAC optimizes the parameters of spatially varying linear transformations of the data in order to minimize the squared norm of the gradient along the section axis, subject to detail-preserving regularization. Assessment on a mouse cortex dataset demonstrates the effectiveness of our approach. Relative to the original data, EMISAC produces a large improvement both in NIQE score, a measure of statistical similarity between orthogonal cross-sections and the original image sections, as well as in accuracy of neurite segmentation, a critical task for this type of data. Compared to a recent independently-developed gradient-domain algorithm, EMISAC achieves significantly better NIQE image quality scores, and equivalent segmentation accuracy; future segmentation algorithms may be able to take advantage of the higher image quality. In addition, on several time-lapse photography sequences, EMISAC significantly reduces lighting artifacts, resulting in greatly improved video quality. This material is based upon work supported by the National Science Foundation under Grant No. 1118055. The following video shows the result of EMISAC on the 1024x1024x100 SNEMI3D training volume, by moving along the z-axis through the 100 x-y cross sections. The original x-y cross sections are shown on the left; the corrected version obtained using EMISAC is shown on the right. In the following examples, the original sequence is shown on the left; the corrected version obtained using EMISAC is shown on the right.